So here’s the deal with river knives . You need one. We’ll discuss what kind and how to wear it later. Inevitably at some point in your career in and around swiftwater you will need to use your river knife. I don’t mean to cut fruit at lunch or spread pb on sandwich. I mean need your knife. Rope entrapment and under-the-raft pins are two of the more severe scenarios in which I have seen the quick and efficient use of a river knife save lives. In our newly developed RRC-professional curriculum, one of the new ‘skills’ adapted from the Kiwi rescue realm centers on getting to and using a knife to self rescue under stressful conditions. The drill involves putting your foot in a loop of rope, and lowering into the current. Once “entrapped,’ you have to reach your knife and cut your foot free. Don’t worry we wont have you cut yourself free of a raft floor, but as extreme as it sounds, doing exactly that should be considered as an option if someone is heads down under a pinned / wrapped raft. Remember it’s all about airway airway airway. 2) Doesn’t get in your way. We coil and stuff throwbags over the shoulder, and countless times I’ve seen rope get stuck around a knife handle. How about raft self-rescue with an exterior front-mounted upward facing fixed blade river knife? It will either pop off ($40 down the drink) or make your already challenging climb back in your boat much harder. 3) Has a tether? This one I can see this one both ways. 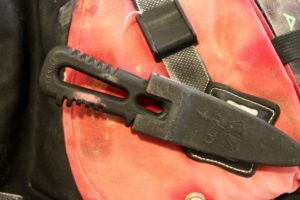 If you’re really using your knife you don’t want to drop it, but you certainly want to make sure that your ‘tether’ doesn’t become an entrapment. Over the years I’ve had varied success with several brands of river knife. Its less about the knife itself and more about where you put it. I like an exterior mounted knife because I know where it i and it is quick to access. 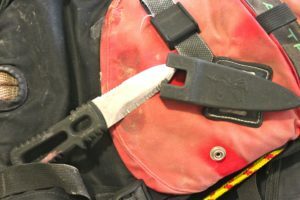 I have also gone to adding an additional folding lock-blade knife in the front pocket of my pfd with lightweight tether. Taking steps to secure your exterior mounted knife makes a big difference. I’ve seen velcro modifications, rubber bands, and tape used to keep the knives in place when you don’t want them out. 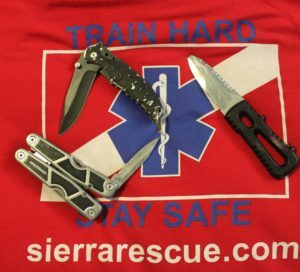 Keep in mind that you’re knife is a life-saving tool and needs to reserved for that use. Of course it can serve other purposes, but have one, and know where it is, because you never know when you’ll need it most.